It wasn't easy picking what books to include this week; there wasn't enough time to do them all, and in all honesty I prefer EEW's books for older readers (the teen and adult stuff.) So I focused on three "sets", as it were; the President's Daughter series, since the most recent volume is being published this year; the Road Home and related books, because it is one of my three favorite EEW books; and Friends for Life / Life Without Friends, because LWF is another one of my three favorite EEW books and because, well, you'll see when you read the post. Before I go book by book, let me say: Meg Powers (the President's daughter) is funny. In typical, trademark Ellen Emerson White style most of the humor is sarcastic or an observation. It's a connection that is made that the reader gets and laughs in recognition. It's not that the books are funny; it's Meg who is funny. And not in a "I'm a comedian" way; it's very much in the manner of Melinda from Speak by Laurie Halse Anderson. Anyway, as you read the below plot descriptions (presidents, shootings, and kidnappings, oh my!) remember: it's all told thru the point of view of someone who is smart and who uses humor as a coping mechanism. So you'll find yourself laughing out loud. Meg Powers is 16. And she's pretty happy with her life in Massachusetts. Great best friend, good friends, gets along with her family. She's pretty average, fairly typical. OK, so Mom is a Senator, but really? Who cares about that in the real world? The press may not care about a Senator's daughter. They do care about the daughter of a woman running for President ... especially when she is a serious contender. Meg's mom has not only announced she is running for President... it looks like she's going to win. Meg is a great character; very real, and with a wicked sense of humor. The relationship with her mother is extremely complex; Meg loves her mother. Meg admires her mother. But it is not an easy relationship. Meg's mother has made choices; choices to go into politics, to be a Senator, to run for President. To have children. Her mother's juggling act is not easy, especially when it comes down to what is best for the country versus what is best for her children. What is also great about Meg's mother is that she is full of shades of gray and insecurities. She is an accomplished woman (hello, President of the United States.) She isn't perfect; and EEW never "fixes" this. A lesser author would have turned the mother into a monster because she doesn't fit the "traditional" role of what a mother "should" be (gasp, Meg's mom doesn't make cookies! Meg's mom isn't Carol Brady perfect! Meg's mom values her career and her children!). A lesser author would have created Quick Fixes with everyone happy in the end. The issues between Meg and her mother continue to be explored in each book of the series. Rarely have I read such a nuanced, realistic, understanding and forgiving mother/daughter relationship. Don't get me wrong; it's far from perfect and sometimes I want to take Meg's mother and throw her out the window (especially in book 3.) But more on that below. 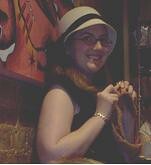 Meg seems to have finally made a new life for herself in DC; new school, new friends, adjusting to the Press. Then Mom, aka the President, gets shot. Those resentments that were bubbling away in The President's Daughter boil over. Meg and her younger brothers are worried about their mother; but they also have to suffer, because with an assassination attempt, security increases as does the attentions of the press. These are situations under which Meg has no control; it's a harsh reality of her life, and of anyone's life, that sometimes our choices are narrower than we'd like. Also good: the bits about the press part, because EEW really gets the pitfalls and problems of the press; the image that is presented by politicians and celebrities, the relationship between the press and those they report on. It's especially interesting to see the impact on those who have not chosen to be in the spotlight -- the "children of". It's the end of Meg's senior year, and as she walks out of school bullets start flying, her secret service agents are shouting, she's getting pulled into a van. She's been kidnapped. The kidnapper is brutal and sadistic. It's going to take every bit of strength and determination that Meg has to survive. The kidnapping -- it's tough. And Meg's escape from the kidnappers is made of awesome. The book also includes Meg's immediate post-kidnapping healing and attempts to re-connect with family and friends. Despite the drama of this -- and the action -- LLTQ is also very internal, as Meg struggles to survive first her kidnapping, then her escape, and, finally, a return to "normal life." While LLTQ ends on an upbeat note, what has happened to Meg is just too drastic to be summed up neatly in one book. Hence, the latest book, years in the making: Long May She Reign, which is about Meg's attempts to live a "normal" life by going to college. And, how EEW has her main character age and mature so that the books age; instead of shifting from J to YA, as some series do, this series shifts from YA to adult. Final note: according to the author's website, the first three books will be reprinted Fall 2008! Yes! So if you cannot get your hands on the books now, make a reminder to yourself to get them next Fall. And in the meanwhile: NO, you don't have to read the first 3 books to read the last. But, having read the last, you'll want to read the first 3.
and Semicolon has been visiting some "under the RADAR" titles. Great review Liz - and yes, I know what show it was that Preston taped - and I know what her favorite soft drink was too. So pleased to hear that the books are going to be reissued! They really haven't circulated in awhile in our library system - and I have to blame, in part, the dated covers. 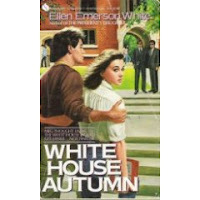 I stopped reading the series at "White House Autumn." Now I'm inspired to read the rest! Thanks! Covers are incredibly important, especially for libraries. It can be the first thing that attracts the reader. Condition is another thing -- and when the older paperbacks get all yellow, a reader has to be really motivated to check it out. *heavy sigh* *goes to Amazon to make the wishlist that much larger* I'm doomed. DOOMED I tell you! Ah, it is SO NICE for me to be reminded of all of the plotlines again. I remember completely freaking out at the TEETH THING in Long Live the Queen. Not to spoil it for anyone, but !!!!!!! -- my jaws ached for hours just reading that. I REALLY look forward to your review. Really, really, REALLY!!! Liz, it's interesting that you were upset with Meg's mother in Long Live the Queen. In a way, I thought she treated Meg with the utmost respect, by virtue of her decision. I sometimes wonder whether she would have gone the same way if it had been, for example, Neal. I _think_ she would have--but, you never know, until you're actually writing it. Thanks to your ruthless pimping in the past of EEW, I've gotten the first two books through ILL and am now anxiously awaiting the third, so I can get to my ARC of LMSR. And despite being very clearly set in the early-mid 1980s, these books work. That's in no small part thanks to Meg, who is just a fantastic, funny, real person. So you've gotten at least one person to read EEW's works, and I'm hopeful that more of her books will be reprinted. I loved The President's Daughter although right now all I remember is a line along the lines of "But you smell like Noxema" and the thing with the blazer. I almost screamed (ok, I did squeal) when I saw the ARC for Long May She Reign at ALA. I didn't know there were more! Thanks for mentioning that Long May She Reign stands alone. I put the ARC on the side in case I needed to read the other books in the series first. Now I just need to find time to read it. Are you saying that there were ARCs at ALA and I somehow missed them!!!??? Drat, being stuck in my own booth. I just found out about Long May She Reign and I'm so very excited. I read the first 3 Meg books many times as a teen, and have read them several times as an adult too. Now I'm digging up some of the other books that I haven't read, to fill the time until the new book comes out. I found you through the Semicolon blog. These were my *favorite* books as a teen, and I still have them all sitting on my shelf. I'm looking forward to reading the new one. Fine, fine, you've convinced me. Also, it makes me feel good that I'm not the only who thought Melinda in Speak was funny - people look at me as though I've two heads when I say that. Entertainment Tonight, right? One of the things I love about Meg is that she enjoys both Entertainment Tonight and the nightly news. One of the amazing things about LLTQ is that Meg continues to be FUNNY, when she's held captive by terrorists, and it's very, very real. I regularly make myself laugh by recalling Meg's comment about whether the guys are going to make their own sundaes. Thank you for this EEW celebration. I read the first three books in grad school via interlibrary loan. 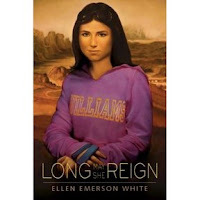 I'm really glad that they're being reissued with new covers-- as I recall, the cover for Long Live the Queen was quite insulting to the main character, as it had Meg looking pretty and sitting with a slight bit of gauze wrapped around her hand when she had gone through so much, much more.